British Sea Power will perform the live soundtrack for a selection of classic Polish animations as part of the Kinetoka Polish Film Festival, taking place at The Barbican next Wednesday (April 6). The band will provide music for, amongst others, Zbigniew Rybczyński's 1981 Oscar-winner Tango, and Daniel Szczechura's The Journey. 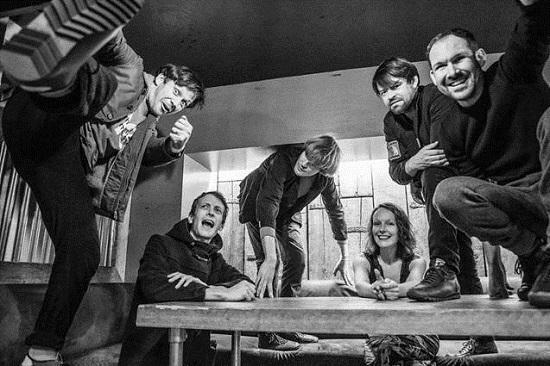 British Sea Power's Jan Scott Wilkinson told tQ: "We got a call, out of the blue really, from the Polish embassy, who asked us to get involved. We’re soundtracking Polish animations from 70-odd years ago, as well as some quite modern ones. "They are some really weird films in there. I didn’t know any of them beforehand. I’m not well up on the history of them. But I’ve watched them while we’ve been playing and they’re...they’re pretty weird. Really quite funny and all very different. Genuinely mad things like adding little legs on ants while they’re animating them. A very early version of the Antz movie. "Weird bicycle races and there's an evil dictator with all the cyclists on a conveyor belt laughing his head off at the end. Like a puppet master enjoying the pointless race and competition of the ordinary folk on their bikes. I just laughed my head off, me. I used to like Polish film posters, used to have a few on the wall. But I lost them. I really must look for some again." You can read ore from Wilkinson as he selects his 13 favourite albums for tQ in our Baker's Dozen interview tomorrow. You can find out more about the Barbican event, which coincides with the launch of BSP's new album Let The Dancers Inherit The Party here.